Join our friendly crew as we trek to Beacon, New York, a hip Hudson River town that is home to the Dia: Beacon contemporary art museum. 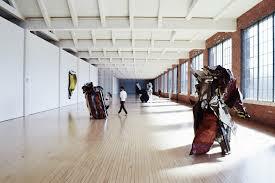 Housed in a former Nabisco box printing factory, the 300,000-square-foot museum features sprawling open spaces and natural light, a perfect backdrop for the incredible monumental works by Dan Flavin, John Chamberlain, Robert Ryman and Agnes Martin, among many others. After our “cultcha” is sated, we’ll work on our appetites. The Roundhouse Restaurant will not disappoint. Set at the foot of the Beacon Falls, this David Rockwell-designed restaurant features a locally sourced farm-to-table menu that changes seasonally. After a leisurely two-course meal, we’ll wend our way down Main Street stopping in some of the quirky home and apparel boutiques and antique shops on the way to Dennings Point Distillery where we’ll end the day with a tasting of a selection of spirits. Fee: $169. Coach leaves from Maplewood Pool Parking Lot. Registration deadline: Mar. 26.